Background and Aim: Diabetes Mellitus (DM) is associated with increased oxidative stress and its related complications. The phenolic components of mulberry (Morus nigra L.) leave have antioxidant components that can modulate oxidative stress. In this study, the beneficial effects of mulberry leaves extract were assessed in diabetic nephropathy and liver cells damage. Materials and Methods: Diabetes induced by high-fat diet and injection of 35 mg/kgBW Streptozotocin (STZ). Forty-four male wistar rats were divided into four groups: healthy control, non-treated, glibenclamide-treated, and extract-treated. The extract-treated group was treated with mulberry leaf extract for 4 weeks. At the end of treatment, kidney, liver and blood samples were collected to assay the biochemical analysis including fasting blood glucose level, albumin, creatinine, urea and uric acid concentrations, white blood cells, hemoglobin, hematocrit and histological evaluation. 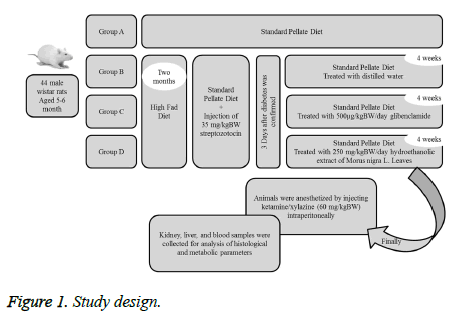 Results: Fasting blood glucose, creatinine, urea and uric acid were significantly in low levels in extract-treated group compared with the non-treated diabetic rats (p<0.001, p=0.03, p=0.009, and p=0.002; respectively). White blood cells level was low level (p<0.001) and hemoglobin and hematocrit levels were higher in extract treated group (p<0.001 and p=0.01; respectively). Serum albumin level in extract-treated rats was significantly higher than untreated group (p<0.001). Evaluating the histopathology of kidney showed that glycogen accumulation, fatty degeneration, and lymphocyte infiltration in extract-treated group were mild; while they were moderate in non-treated group; moreover, liver tissue evaluation showed that the fatty degeneration in extracttreated rats was mild and the cytoplasm of hepatocytes was distended by smaller amount of fatty droplets. Conclusion: The antioxidant properties of Mulberry leaves inhibited kidney and liver damage in diabetic rats. These results can be a base to evaluate the effects of mulberry (Morus nigra L.) leaves extract in the management of hyperuricemia, nephropathy, and fatty degeneration in liver cells in diabetic human patients. Morus nigra L. leave, Hydroethanolic extract, Kidney, Liver, Histological structure, Type 2 diabetes. The prevalence of Type 2 Diabetes (T2DM) was increasing worldwide. According to the International Diabetes Federation (IDF) report in 2013, there were 382 million people living with diabetes worldwide, and this rate was expected to increase 592 million by 2035 . The World Health Organization (WHO) reported that the major burden of diabetes was related to the developing countries (170% increment in developing countries compare with 42% increment in developed countries) . Diabetes is manifested by dysfunction or deficiency of insulin secretion from beta cells that results in hyperglycemia and lipid abnormality . Prolonged hyperglycemia in the body can attenuate antioxidant system against oxidative stress situations . According to the studies, diabetes is the major cause of renal morbidity and mortality [5,6]. Urea and creatinine were considered as renal function tests and serum albumin and hemoglobin were categorized as independent risk predictors of End-Stage Renal Disease (ESRD). Abnormalities of lipolysis and triglyceride storage in insulinsensitive tissues such as the liver are the early appearance of conditions characterized by insulin resistance and are detectable earlier than fasting hyperglycemia. The excess in free fatty acids, found in the insulin-resistant state, is known to be toxic to hepatocytes. The supposed mechanisms include cell membrane disruption at high concentration, toxin formation, mitochondrial dysfunction, and activation and inhibition of main steps in the regulation of metabolism. Dietary antioxidants supplementation has been proved as a complementary treatment in the management of diabetes. Some antidiabetic agents were reported to have antioxidant properties, independent to their role in glucose control . Recently, there has been a considerable interest in using natural antioxidants from plant materials. Herbal compounds were widely prescribed to control of chronic diseases due to the fewer side effects recently. Morus nigra L. a species belongs to Moraceae family and the genus Morus, usually known as a black mulberry, and widely cultivated to feeding silkworms [8,9]. Several species of Morus due to a variety of phenolic compounds with antioxidant properties are widely used in traditional medicine as an analgesic, diuretic, antitussive, sedative, anxiolytic, and hypotensive and to control of edema [9-11]. The leaves of mulberry species were consumed as antihyperglycemic nutraceutical foods for patients with diabetes, due to containing 1-deoxynojirimycin as one of the most potent α-glycosidase inhibitors agent . Important phytoconstituents of M. nigra have been reported flavonoids, alkaloids and phenols [13,14]. Considering the effective components of M. nigra L., we decided to evaluate the effects of mulberry extract on renal function tests and histological structure in STZ-induced diabetic rats. The aim of this study was to evaluate the effects of M. nigra L. extract on the renal function tests and kidney and liver histological structure in diabetic rats. Forty-four male wistar rats, aged 5-6 month and weight 250-300 g, were bred and housed at the Animal House of the Tabriz University of Medical Sciences. Ethical Committee Clearance from Tabriz University of Medical Sciences (Rec. 1394.479) approved the protocol of study. The rats were maintained in controlled standard triplex temperature cages (23-25°C, humidity of 50-68%), and on a 12 h light/dark cycle. The animals were maintained on ad libitum feeding. Before testing, they were quarantined for one week to acclimatize to laboratory condition. All ethical issues related to the storage and handlings of animals were administered. The rats were provided the commercial standard pellete diet and tap water ad libitum. The pellete diet contains the following chemical composition: protein 23%, fat 5%, and carbohydrate 53%. Leaves of M. nigra were collected from a village in Urmia. The leaves were washed and kept at 25°C in the shade and exposed to the air flow for a week. Until the extraction, the dried leaves were stored at room temperature. Extraction process was done by grounding and powdering of plant samples in extraction phase, 100 grams of obtained powder was transferred into a one-liter erlenmeyer flask and 500 ml of ethanol (80%) was added to it and was kept away from light for 24 hours. Then, the solution was filtered through Whatman filter paper No. 1. This process was repeated 3 times. Finally the obtained extract was dried by rotary evaporator at 50°C and the percent of the dry extract was calculated. Diabetes was induced by high fat diet and a single intraperitoneal injection of STZ at the dose of 35 mg/kg of body weight. Animals received a high-fat diet containing wheat flour 10%, sugar 20%, fat 31%, casein 25%, mixtures of vitamins and minerals 6%, methionine 0.3%, yeast 0.1% and sodium chloride 0.1% for a month. After one week STZ was injected and seven days later diabetes was induced in rats. Diabetes was confirmed by measuring of the blood glucose levels using a glucometer (ACCU-CHEK Performa Blood Glucose Monitoring System). Blood samples were collected from the tail of rats. Blood sugars higher than 250 mg/dl were considered as the confirmation of diabetes. Moreover, oral glucose tolerance test was performed to confirm the diabetes induction. For this purpose, a glucose solution was administered by the animals. After 0, 30, 60 and 120 minutes blood glucose and insulin concentrations were measured. After three days, the intervention group was treated by 250 mg/ KgBW/day hydroethanolic extract of Morus nigra L. Leaves six days a week for 4 weeks. The rats were divided into four groups consisting of eleven rats (Figure 1). Group A (control group/ non-diabetic rats): Rats received standard pellete diet. Group B (sham group): Diabetic rats treated with distilled water. Group C: Diabetic rats treated with 500 μg/kgBW/day glibenclamide. Group D: Diabetic rats treated with 250 mg/kgBW/day hydroethanolic extract of Morus nigra L. Leaves. Three rats from non-treated diabetic group died before the end of experiment. At the end of experimental period, the rats were anesthetized by injecting of ketamine/xylazine (60 mg/kgBW) intraperitoneally and blood samples were collected to measure the serum albumin, creatinine, urea and uric acid by enzymatic methods using a biochemical autoanalyzer. Using a hematology analyser, hemoglobin and hematocrit levels, platelet counts, red blood and white blood cell counts were measured. At the end of the intervention, kidney and liver tissues were removed for assessment histological analysis. After extracting the kidney and isolating capsules, they were placed in Bowen fixative for three days. Then the tissues were washed with normal saline and molded in agar 7%. Using microtome machine the tissues were cut into 1mm sections and embedded in paraffin; then stained with hematoxylin and eosin for histological examination according to standard procedure. For examination of histopathological changes of liver tissue 5 mm fragments of the liver tissues were separated and placed in 10% buffered formalin. The necessary cuts were done in paraffin using microtome then the histological stained was done. The changes were observed under a microscope (Olympus BX40) and photographed with a camera (Olympus camera and film Kunia 100 ASO). Two hundred and fifty grams of hematoxylin in absolute alcohol and 50 g of alum in 500 cc distilled water were dissolved. Heat was used to dissolve the album. Then, two solutions were mixed together and the mixture was heat up until the boiling point. Five and a half grams of HgO was added and cooled quickly before using the mixture, 20 cc glacial acetic acid was added to it. For preparation of eosin, ten grams of eosin dissolved in 1000 cc distilled water and passed through the filter paper. Then 3 cc of glacial acetic acid added to it. Histopathological parameters including glycogen accumulation of renal convoluted tubules, lymphocyte infiltration and fatty degeneration in the kidney tissue of group C and D rats were discussed. The results were presented as mean (SD). The normality of data was assessed by Kolmogrov-Smirnov test . Statistical comparison between groups was done by one-way Analysis of Variance (ANOVA). To determine the differences between groups Tukey-Kramer multiple comparison test was used. Significant differences between mean values of different groups were determined by one-way Analysis of Variance (ANOVA) and Turkey post hoc tests. Data were analysed by SPSS software version 20. Differences were considered significant at P<0.05. 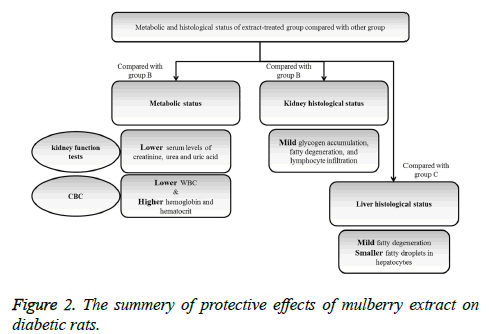 The protective effects of mulberry leaf extract on kidney function tests and histology of kidney tissue were summarized in Figure 2. Figure 2: The summery of protective effects of mulberry extract on diabetic rats. After 4 weeks administration of Mulberry (250 mg/kg/day), blood glucose concentration in diabetic rats was significantly in low level in comparison with non-treated diabetic rats (p<0.001) (Table 1). According to the obtained results, level of renal function indexes including creatinine, urea, and uric acid were significantly lower in extract treated group compared with non-treated diabetic group (p=0.03, p=0.009, and p=0.002; respectively). Serum creatinine and urea levels were lower in glibenclamide-treated rats compared with the nontreated but the difference was not statistically significant. Level of serum albumin in extract-treated rats was significantly higher than non-treated diabetic group (p<0.001). Table 1. Biochemical measurements in healthy control, non-treated, glibenclamide-treated, and extract-treated groups (A, B, C, and D; respectively) after 4 weeks intervention. WBC levels in non-treated diabetic rats were significantly higher than extract treated rats (p<0.001); the level of hemoglobin and hematocrit in extract-treated group was higher than non-treated group and the differences were significant (p<0.001 and p=0.01; respectively). Figure 3 showed glycogen accumulation (short arrows) of renal convoluted tubules associated with basement membrane thickening and moderate lymphocyte infiltration (long arrows) in groups B and C. Glycogen accumulation (arrow) and fatty degeneration (arrow heads) of renal convoluted tubules were mild in extract-treated group. Glycogen particles were uniformly dispersed throughout the cytoplasm; whereas, in fatty degeneration discrete vacuoles were present in the cytoplasm of epithelial cells. Histopathology of liver was studied in group C (glibenclamide-treated group) and D (extract-treated group). Figure 4 shows the hydropic degeneration of hepatocytes due to moderate glycogen accumulation (short arrows) and fatty degeneration (long arrows) in groups C and D. The cytoplasm of hepatocytes is distended by glycogen particles and fatty droplets. Group C’s kupffer cell hyperplasia is also present (in the left side). The fatty degeneration in extract treated rats with diabetes is mild (long arrows) and the cytoplasm of hepatocytes is distended by smaller amount of fatty droplets. Figure 3: Microscopic images of diabetic rat kidney slices (3a: nontreated rats, 3b: glibenclamide-treated rats, and 3c: extract-treated rats). 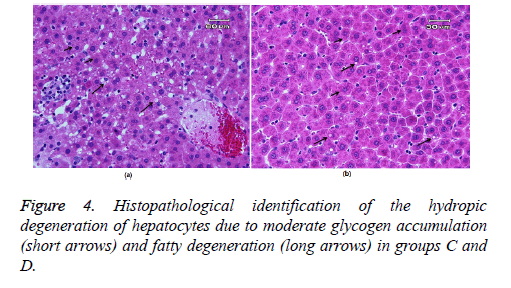 Figure 4: Histopathological identification of the hydropic degeneration of hepatocytes due to moderate glycogen accumulation (short arrows) and fatty degeneration (long arrows) in groups C and D.
Fasting blood glucose was not change significantly in in untreated diabetic rats. Blood glucose levels in mulberry treatment group were remarkably lower; however, serum insulin levels were significantly higher compared with nontreated diabetic rats. This was in accordance with the study conducted by Araujo et al. whom showed that the leaf extract of M. nigra L. alleviated hyperglycemia in diabetes. In other trial, Ahmed et al. showed antidiabetic activity of the Morus nigra leaf extracts in STZ-diabetic rats and also administration of a leaf extract decreased glucose increased insulin levels . The mechanisms of action of mulberry in controlling of hyperglycemia and glycosuria could be due to: a) the Ncontaining sugars (GAL-DNJ) isolated from mulberry leaves which inhibit the functions of a-glucosidase, a-mannosidase and h-galactosidase enzymes , b) fagomine which potentiates the glucose induced insulin release similar to the action of glibenclamide , a sulfonylurea drugs which triggers the release of endogenous insulin , and c) increase the uptake of glucose in tissue by mulberry leaves . Investigating the biochemical and histopathological changes in the serum and kidneys of diabetic rats treated with M. nigra extract was the main aim of present study. According to the results, the level of serum creatinine and urea were significantly lower in extract-treated diabetic rats compared with the non-treated group (Table 1). The plasma creatinine and urea are established markers of Glomerular Filtration Rate (GFR). Plasma creatinine is a more sensitive index of kidney function . An increase in urea level is seen when there is damage in the kidney or the kidney is not functional properly. Increment of blood urea level with the increment of blood sugar level clearly indicated that the increase blood sugar level caused damage to the kidney. In a similar study Rahimi et al. showed that administration of M. nigra extract significantly reduced urea levels compared with the positive control group. The level of serum albumin in extract-treated rats was significantly higher than in diabetic group. Hypoalbuminemia is a common problem in diabetic animals and is generally attributed in the presence of nephropathy . A variety of flavonoids viz., quercetin-3-O-βDglucopyranoside , phytoalexinsmoracin C, moracin N, and chalcomoracin  present in mulberry leaves were reported to be capable of scavenging the superoxide anion and inhibit lipid peroxidation and all these compounds were well known for their antioxidative properties. Considering the results of renal functional tests, it can be understood that by antioxidant capability, mulberry extract could prevent kidney dysfunction in diabetic group. The effect of mulberry administration on CBC results evaluated for the first time in the present study. The CBC analyses showed improvement in extract-treated group. It has been shown a relationship between inflammatory status and WBC counts . Many extracts from leaves of mulberry species have been proven to possess anti-inflammatory activities in many animal models . Chemical compounds isolated from Morus nigra, including betulinic acid, β- sitosterol and germanicol, may be responsible for the antiinflammatory effect of the extract. Marina et al. used a HPLC fingerprint for phytochemical analysis of the Morus nigra extract. They found that the chemical compounds isolated from Morus nigra, including betulinic acid, β- sitosterol and germanicol, may be responsible for the antiinflammatory effects of the extract. Considering the antiinflammatory potential of mulberry extract, it can be understood that the consumption of this extract during the intervention, could control anemia and white blood cells counts in extract-treated diabetic rats. According to the histological examination, glycogen accumulation and fatty degeneration of renal convoluted tubules were mild in extract-treated group; however, they were moderate in groups B and C. This may be interpreted as a result of the protective effects of mulberry extract in studied tissue and reduced the STZ-induced oxidative stress that causes the fatty degeneration and the aggregation of the inflammatory cells in the kidney. According to several investigations, medicinal plants, such as M. nigra L., are widely used as components with hypoglycemic and anti-diabetic properties that can ameliorate complications of diabetes mellitus . Rahimi-Madiseh et al. found milder glomerular damage in the group treated with M. nigra extract compared with diabetic and positive controls. They showed that administration of M. nigra extract can prevent kidney tissue damage . As shown in other studies the protective effects of mulberry extract may be due to the presence of antioxidant components in the plant that can reduce the oxidative stress in the cells and this led to normal structures and functions . In a similar study conducted by Hilfy et al. , they evaluated the preventive potential of the use of antioxidant extract on kidney damages in diabetic rats. They found less extensive histological changes like fatty degeneration in cells lining of kidney tubules, in alloxan-induced diabetic rat treated with green tea. They conclude that the antioxidant capability of green tee extract reduced the degenerative effects of alloxan in histological structures. Glycogen accumulation in this study was mild and the glycogen particles were uniformly dispersed throughout the cytoplasm in extract-treated group. As stated in previous researches kidney glycogen accumulation was strongly related to the plasma glucose levels . Nannipieri et al. showed that prolonged hyperglycemia was the sole driving force for glycogen accumulates in the renal tubules of untreated diabetes rats . Researches showed that administration of M. nigra extract seems to prevent kidney tissue damage and to be beneficial to patients with diabetes . Controlling hyperglycemia by mulberry extract in present study moderated glycogen accumulation in extract-treated diabetic rats. Considering the results of present study it can be concluded that Morus nigra leaf extract could be beneficial to regulate diabetes-associated renal complications and histological structure. As stated above the protective effect of mulberry extract on kidney function and/or structure has not been evaluated before; so, the results of present study can be a valuable base for further investigations in this field. Histopathology of liver Irregularities in insulin action may be involved in the pathogenesis of invasion of fatty acids to the liver and fatty liver disease (NAFLD), conditions that range from clinically benign fatty liver to its more severe form, NASH (Non-Alcoholic Steatohepatitis) . As shown in Figure 4 the liver cytoplasm in rats with diabetes was filled with lipid droplets of various sizes and showed fatty degeneration. According to the present results, the fatty degeneration in extract treated rats with diabetes was mild and the cytoplasm of hepatocytes is distended by smaller amount of fatty droplets compared with glibenclamide-treated diabetic rats. By controlling inflammation and so regulating insulin action, the leaf extract of mulberry may modulate fat accumulation and degeneration in liver cells which may be due to its high phenolic content. High-fat diet can cause hyperlipidemia in rats as characterized by decreased levels of antioxidant enzymes, increased levels of cholesterol profile and damages in hepatic tissues. Metabolic function damage would be the result of a long-term consumption of high-fat diet that makes lipid changes. Previous investigations revealed that polyphenolic compounds can protect against oxidative damage. Lívia et al. showed that the organic leaf extract was able to prevent both proteins and lipids oxidative damages in liver and kidney tissues by its high phenolic content and antioxidant capacity. Dietary polyphenols will improve the clinical outcomes for type 2 diabetics. As shown in present study M. nigra L. leaf extract could improve liver tissue damages through decreasing the oxidative stress and inflammation and regulating insulin action through its phenolic compounds. More studies are needed to evaluate the efficacy of several herbal compounds in protection of diabetes-associated tissue damages. Our results showed that M. nigra L. leaf extract could promote kidney functions and kidney and liver structures through decreasing the oxidative stress in diabetic rats. Further studies are needed to confirm the efficacy of mulberry extract in diabetes management. Doing more studies to determine the effects of M. nigra L. leaf extract in human diabetic subjects are suggested. The present study was funded by the Student Research Committee of Tabriz University of Medical Sciences. The authors declare no conflict of interest/financial disclosure statement. Klionsky DJ, Abdelmohsen K, Abe A, Abedin MJ, Abeliovich H. Guidelines for the use and interpretation of assays for monitoring autophagy. Autophagy (3rd edn.) 2016; 12: 1-222. Wild S, Roglic G, Green A, Sicree R, King H. Global prevalence of diabetes: estimates for the year 2000 and projections for 2030. Diabetes Care 2004; 27: 1047-1053. Papadakis M, Tierney L, Mcphee S. Current medical diagnosis and treatment. International edition. Newyork: Lange medical books/Mc Graw-Hill 2002. Sheikhpour R. Diabetes and oxidative stress: The mechanism and action. IJDO 2013; 5: 40-46. Mshelia D. Role of free radicals in pathogenesis of diabetes nephropathy. Annals African Medicine 2004; 3: 55-62. Ramkumar KM, Ponmanickam P, Velayuthaprabhu S, Archunan G, Rajaguru P. Protective effect of Gymnema montanum against renal damage in experimental diabetic rats. Food Chem Toxicol 2009; 47: 2516-2521.
de Mesquita Padilha M, Vilela FC, da Silva MJD, dos Santos MH, Alves-da-Silva G, Giusti-Paiva A. Antinociceptive effect of the extract of Morus nigra leaves in mice. J Med Food 2009; 12: 1381-1385. Nomura T, Hano Y. Isoprenoid-substituted phenolic compounds of moraceous plants. Nat Prod Rep 1994; 11: 205-218. Yadav AV, Kawale LA, Nade VS. Effect of Morus alba L. (mulberry) leaves on anxiety in mice. Indian J Pharmacol 2008; 40: 32-36. Sharma R, Sharma A, Shono T, Takasugi M, Shirata A, Fujimura T. Mulberry moracins: scavengers of UV stress-generated free radicals. Biosci Biotechnol Biochem 2001; 65: 1402-1405. Kim JW, Kim SU, Lee HS, Kim I, Ahn MY, Ryu KS. Determination of 1-deoxynojirimycin in Morus alba L. leaves by derivatization with 9-fluorenylmethyl chloroformate followed by reversed-phase high-performance liquid chromatography. J Chromatogr A 2003; 1002: 93-99. Malik MNH, Salma U, Qayyum A, Samreen S. Phytochemical analysis and cardiac depressant activity of aqueous methanolic extract of Morus nigra L. Fruit. J Appl Pharm Sci 2012; 2: 39. Ozgen M, Serce S, Kaya C. Phytochemical and antioxidant properties of anthocyanin-rich Morus nigra and Morus rubra fruits. Scientia Horticulturae 2009; 119: 275-279. Asghari M, Mohammadi S. Statistical series: introduction to statistical inference (Point estimation, confidence interval and hypothesis testing). J Diab Lip Disord 2013; 12: 173-192. Araujo CM, de Padua Lucio K, Silva ME, Isoldi MC, de Souza GHB, Brandao GC. Morus nigra leaf extract improves glycemic response and redox profile in the liver of diabetic rats. Food Function 2015; 6: 3490-3499. Abd El-Mawla A, Mohamed KM, Mostafa AM. Induction of biologically active flavonoids in cell cultures of Morus nigra and testing their hypoglycemic efficacy. Scientia Pharm 2011; 79: 951-962. Asano N, Oseki K, Kizu H, Matsui K. Nitrogen-in-the-ring pyranoses and furanoses: structural basis of inhibition of mammalian glycosidases. J Med Chem 1994; 37: 3701-3706. Kimura M, Chen FJ, Nakashima N, Kimura I, Asano N, Koya S. Antihyperglycemic effects of N-containing sugars derived from mulberry leaves in streptozocin-induced diabetic mice. J Trad Med 1995; 12: 214-219. Lalwancy L. Oral drugs in diabetes. J Diabet Assoc India 1974; 14: 17-27. Chen F, Nakashima N, Kimura I, Kimura M. Hypoglycemic activity and mechanisms of extracts from mulberry leaves (Folium mori) and cortex mori radicis in streptozotocin-induced diabetic mice. Yakugaku Zasshi J Pharm Soc Japan 1995; 115: 476-482. Singh P, Khan S. Renal function test on the basis of serum creatinine and urea in type-2 diabetics and nondiabetics. Bali Med J 2014; 3. Sivajothi V, Dey A, Jayakar B, Rajkapoor B. Antihyperglycemic, antihyperlipidemic and antioxidant effect of Phyllanthus rheedii on streptozotocin induced diabetic rats. Iran J Pharm Res 2010: 53-9. Kim SY, Gao JJ, Lee WC, Ryu KS, Lee KR. Antioxidative flavonoids from the leaves of Morus alba. Arch Pharm Res 1999; 22: 81-85. Farhangi MA, Keshavarz SA, Eshraghian M, Ostadrahimi A, Saboor-Yaraghi AA. White blood cell count in women: relation to inflammatory biomarkers, haematological profiles, visceral adiposity, and other cardiovascular risk factors. J Health Popul Nutr 2013; 31: 58-64. Padilha MM, Vilela FC, Rocha CQ, Dias MJ, Soncini R. Antiinflammatory properties of Morus nigra leaves. Phytother Res 2010; 24: 1496-1500. Rahimi-Madiseh M, Naimi A, Heydarian E, Rafieian-Kopaei M. Renal biochemical and histopathological alterations of diabetic rats under treatment with hydro alcoholic Morus nigra extract. J Renal Inj Prev 2017; 6. Tag HM. Hepatoprotective effect of mulberry (Morus nigra) leaves extract against methotrexate induced hepatotoxicity in male albino rat. BMC Compl Alt Med 2015; 15: 252. Al-Hilfy JHY. Effect of green tea extract on histological structure of kidney, pancreas and adrenal gland in alloxan-induced diabetic male albino rats. J Al-Nahrain Univ 2013; 16: 156-165. Nannipieri M, Lanfranchi A, Santerini D, Catalano C, van de Werve G, Ferrannini E. Influence of long-term diabetes on renal glycogen metabolism in the rat. Nephron 2001; 87: 50-57. Bugianesi E, McCullough AJ, Marchesini G. Insulin resistance: a metabolic pathway to chronic liver disease. Hepatology 2005; 42: 987-1000. Lívia S, Caroline D, Cláudia F, Henriques J, Mirian S. Hepatoprotective, cardioprotective, and renal-protective effects of organic and conventional grapevine leaf extracts (Vitis. labrusca var. Bordo) on Wistar rat tissues. An Acad Brasil Ciênc 2011; 83: 1403-11.